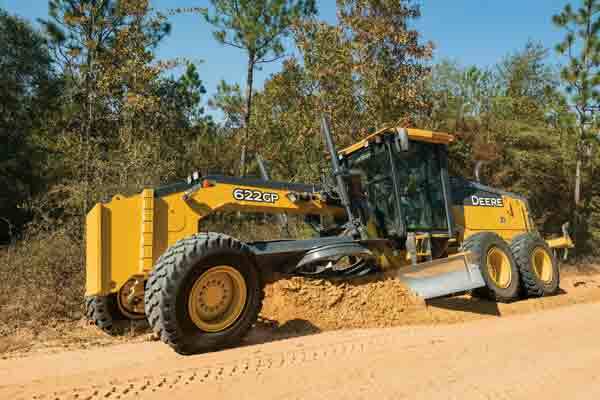 John Deere is adding to its best-in-class G-Series motor grader line-up with the addition of two models — the 620G/GP and 622G/GP. That were on display at CONEXPO-CON/AGG 2017, the 620G/GP and 622G/GP are designed for cities, townships and contractors that prefer lighter and more fuel-efficient graders on the job. The Moline-based manufacturer is also adding a dual joystick option on all Grade Pro (GP) models, along with ripper-stow automation, courtesy lighting and an updated high-resolution reverse camera monitor, which are new to all G/GP models. “Our G-Series lineup is all about offering contractors and governmental customers the grader of ‘choice,’ allowing them to choose the right machine for their application. 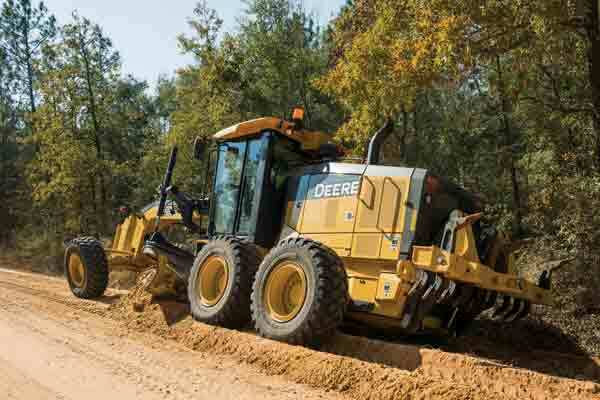 Customers asked for a lighter and more fuel-efficient grader, and the 620G and 622G answer the call,” said Luke Kurth, product marketing manager, motor graders, John Deere Construction & Forestry. “We’re enthusiastic about the new dual joystick option as well. Now operators and owners can select from the traditional antler rack mechanical controls, interchangeable GP fingertip controls or dual joysticks, whichever they prefer and are most productive with — all while retaining the steering wheel.” Both the 620G and 622G boast the fuel-efficient Final Tier 4 6.8L John Deere diesel engine with 215 horsepower and 225 horsepower, respectively. The generous horsepower, torque and blade pull deliver the power and lugging ability to get through tough spots. The operating weights of the 620G (40,350 pounds) and 622G (42,060 pounds) are ideal for applications requiring smaller graders. Eco mode, standard on all John Deere graders, helps optimize fuel usage, decreasing operating costs by an additional five to 10 percent compared to the larger 670G and 672G models. The new dual joystick option provides intuitive control for operators who prefer joystick control to the standard antler rack. Hand motion is minimized during direction changes and gear shifting. In contrast to the competition, this option provides improved comfort of controls by eliminating the need to “twist” for blade circle or articulation. Other updates to the G-Series line include the addition of a 7-inch, high-resolution reverse camera monitor that provides a clear picture to the operator when reversing around obstacles. Standard courtesy lighting turns on the machine lights as the operator exits the machine at the end of the day, which is especially important in dark conditions. On GP models, ripper-stow quickly returns the ripper to its fully raised position at the end of pass simply by double-tapping the control. The G-Series features eight models (620G/GP, 622G/GP, 670G/GP, 672G/GP, 770G/GP, 772G/GP, 870G/GP, 872G/GP) with net horsepower ranging from 215 to 300. Four of the units — the 622G/GP, 672G/GP, 772G/GP and 872G/GP — feature six-wheel drive, enabling them to power through the toughest cuts with power flowing to all wheels. Six-wheel drive gives operators increased traction, the ability to get more work done in fewer blading passes and a 30-percent increase in blade pull. The John Deere “open-architecture” design lets customers employ their favorite brand of grade-control system. GP models come factory-equipped with bulkhead connectors, sensor mounts, electrical wiring harnesses, integrated controls and moldboard mast mounts. Machines can also be factory-installed with Topcon, Trimble or the new Leica ready kits to make installation quick and easy. All GP models come standard with automated cross-slope. Fleet managers looking to get the most out of their G-Series motor graders can rely on their John Deere dealers to provide Ultimate Uptime, featuring John Deere WorkSight. With Ultimate Uptime, owners receive predelivery and follow-up inspections that include five years of JDLink telematics, machine health prognostics, remote diagnostics, programming capabilities and the ability to add dealer-provided uptime solutions to create a customized package.